1. Bring a large pan of salted water to a rolling boil. Trim the stalk end of the beans but leave the tails, then add to the pan of boiling water and cook for 8 minutes or until tender, drain. over the beans with a generous seasoning of black pepper. Serve with the lamb stifado. 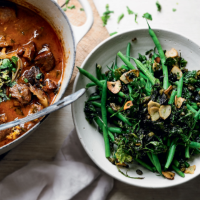 Serve this alongside Lamb stifado for a wonderful Sunday lunch.